A hearty and delicious traditional Greek recipe perfect for a cold winter’s day! Youvarlakia or giouvarlakia is a famous Greek meatball soup, which is full of Mediterranean flavors, juicy meatballs and finished off with a delicious egg lemon sauce (avgolemono).. This Greek meatball soup (youvarlakia or giouvarlakia soup) is a classic delicacy made basically with meatballs (youvarlakia) and rice. It’s sounds really simple, but it’s simplicity of preparation and presentation, which is part of the Greek cooking, takes nothing out of it’s exquisite taste! The secret ingredient for this extra creamy Greek recipe for youvarlakia soup is the Avgolemono – an egg lemon sauce that is often added in Greek recipes and acts as a thickening agent, giving this soup a unique texture and flavour. This Greek meatball soup recipe for youvarlakia includes the traditional recipe for preparing an egg lemon sauce (avgolemono). Although the basic Greek recipe is relatively simple, my experience has shown that it can be really tricky. If you have ever tried making youvarlakia soup or any other Greek recipe which includes Avgolemono before, you must know that lots of things can go wrong leading to a disaster. The most common mistake is that the Avgolemono – egg lemon sauce curdles and gets lumpy. To prevent you from making the same mistakes I have put together this short and simple guide to the perfect egg-lemon sauce and help you succeed every single time. Serve this delicious Greek meatball soup (youvarlakia), while still warm with some sprinkled parsley as garnish and some crusty bread to dig in all that delicious sauce! To prepare this Greek meatball soup, start by making the meatballs (youvarlakia). Place all the meatball ingredients into a large bowl, knead the mixture squeezing the ingredients with your hand until smooth. Leave the mixture to rest in the fridge for 15 minutes. (This will prevent the youvarlakia to break up when boiled.) Form the meatballs (youvarlakia) and set them aside. To prepare the egg lemon sauce for the Greek meatball soup, crack the eggs into a bowl and whisk. Add the lemon juice and the flour and whisk well. Add into the bowl a ladle of hot soup and whisk quickly. Add one more ladle and whisk again until combined. Stir in the egg lemon sauce into the youvarlakia soup and cook for 2-3 minutes over medium heat, until warm but not boiling. Serve this extra warming Greek meatball soup, while still hot with a sprinkle of chopped parsley. Thanks so much this is much easier than the way my mother made hers. Please tell me this can be frozen as my husband doesn’t eat Greek food but I love it ! I am not so sure about freezing them. Do to know how the sauce will end up being after it gets defrosted but I guess it’s worth a try! The sauce doesn’t freeze, but it’s easy to make. Freeze the meat balls and whip up the sauce when you want it again! Thanks for answering Eli maybe I will try with a small serving I will let you know if it works! Does the long grain rice need to be cooked? Meat in the United States is sold in lbs. not oz. so please use lbs. There are all kinds of websites that will make the conversion from ounces to pounds for you. I’m also in the United States, and found many conversion websites using Google. spoken like a true American. life exists outside of the US. Thank you Betty, that is a good tip! I will add to the recipe! I use chicken broth not just plain water. Thats a good idea – I will try it like that as well. I suspect the chicken broth would make the soup a little stronger in flavor, right? I don’t undrstand the soup part. Is this stock? Am I missing something please? This dish is a soup, or possibly a stew. You can use stock instead of water if you prefer. So all the rice is mixed in the meat balls dont you add any rice in the water? I put the rice only in the meatballs, not in the broth. I sometimes add a chopped potato or carrot to the broth to give extra body and flavor. 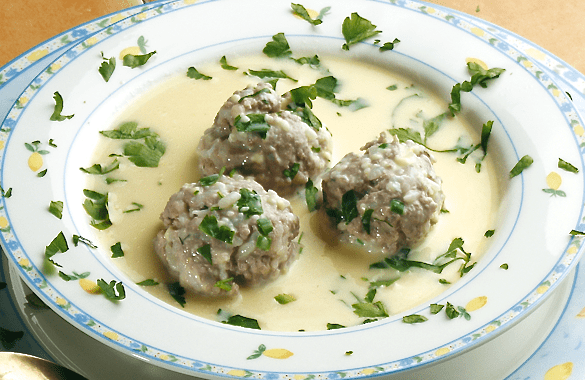 Pingback: A traditional Greek meatball soup in an avgolemono (egg lemon) sauce. I also soak some bread in milk or water and add it to the meatball mixture, after I squeeze the moisture out. Makes the meatballs very tender…no carrot, minced garlic instead. Add mint, too, fresh or dried. I use a combo of water and chicken broth.